YOU blink and you’ll miss a new restaurant opening in Mijas these days. While Marbella may still be the culinary capital of the Costa del Sol, the white village and its coastal resort of La Cala is fast catching up. It is perhaps telling that global superstar Michel Roux Jr named Mijas as the town that inspired him to follow in the footsteps of his famous father at two Michelin star Le Gavroche in London. The British-born star of Masterchef and Gordon Ramsey’s Hell’s Kitchen visited the pueblo with his family as a child and tried things he had ‘never tasted before’. It is a legacy that has been continued to this day with the likes of London-trained chefs, such as Joffrey Charles and William Squires, at El Oceano restaurant. 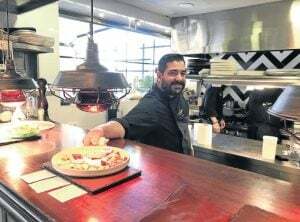 “It’s getting better and better here and there is a lot of competition,” explains Squires, who worked for four years under famous Melbourne chef Joel Valvason. “There are a lot of young chefs with new ideas and it’s great to try new things then get back and do things with a new twist,” he adds. Take a spin around La Cala these days and you will find the wonderful Pura Cepa wine bar, its creative neighbour KonFusion, Elliot Wright and his showbizzy, but surprisingly good haunt Olivias, the amazing fish restaurant the Blue Marlin – probably the best on the coast – and now the original Utopia. It was here that I ate an amazing spread of healthy tapas, including hummus, guacamole and a great burrata of mozzarella on a bed of rocket and cherry tomatoes, with shavings of parmesan on top. The brainchild of Pepe Villalba and Ana Romero, these two young local Andalucians are so welcome back on their own terra firma, having spent the last six years living and working abroad in Berlin and Bristol through the recession. “We knew it was time to come back now the crisis is easing,” explains Pepe, who is the whiz in the kitchen. “We found this spot and built it up from scratch brick by brick.” And now what was once a waste ground parking lot for cars is today a lovely hidden garden with a great funky atmosphere. And yet there is more in La Cala, in particular with Joffreys, which is slowly becoming one of the true culinary references on the coast. Classy French chef Joffrey Charles offers up a wonderful mix of exciting dishes, such as balls of foie served in a hazelnut crust with figs, and scallops served with slices of bacon, with capers. His bubbly partner Lisa Burgess, who worked in TV for years, looks after the guests with aplomb. Having dipped into his turbot with fennel, and panna cotta with passion fruit I am going to put my neck out again (as I did last year) and tip him for a future Michelin star. Nearby, make sure to check out the fabulously tasty Blue Marlin – the only ‘northern European fish restaurant’ in the area – run by Alison and Steve Hyatt, who are hard at it preparing stews and dishes hours before opening. Almost unique to the coast, the fish here is unbelievably good with plenty of rich stews and dishes like seafood pasta, which is popular, not to mention the amazing clam chowder. They became famous from the TV show A New Life in the Sun and run a tight ship, if you’ll excuse the pun, with hundreds of regulars swearing by their place. It is not really surprising, given that the pair ran restaurants back in Scotland, and chef Steve has worked in many places around the world and his family have been running inns as far back as 1760. And there is more at wonderful El Oceano, a hotel restaurant right on the beach, which is veritably glamour personified. Head chef William Squires, 31, has worked around the world, including four years in Australia and three years in Ireland, and has built up a skillful repertoire with his handling of Asiatic dishes in particular. The beef tartare is his tete de cuvee, marinated overnight, then rolled in peppercorns before being seared for 30 seconds and then rested in the fridge before being served. I also liked the tempura prawns with wasabi, as well as the excellent scallops with ham, while my true winner was the original Manchego Arancini, or rice balls seasoned with saffron. The restaurant sits in a wonderful spot right on the beach and after a multi-million euro overhaul it is even more glamorous than before. The only place that can come near to matching them for style is Olivia’s, where TV star Elliot Wright has invested over three million creating the ultimate dining experience. For yet another completely different style, head 400 metres inland to find the fantastic familystyle Ole restaurant, where Juan Gomez has been on the go for an incredible 25 years. Juan is a charming host – speaking perfect English – while his son Victor is equally friendly and both put a great emphasis on fresh ingredients, much from their finca near Ronda. Looking for somewhere else new? Why not try the great wine and tapas Tapavino, which can be found up in Calahonda and is incredibly busy. This is no surprise with Brit Craig Hyatt and Canadian wife Robynne running a tight ship that is not surprising given their hotel and restaurant background. The pair worked for the Renaissance and Vintage Hotels groups in Canada and were frequently dealing in complex and detailed wine lists. You’ll find a good mix of tapas here to go with dozens of wines by the glass. Sit on the great dining terrace and watch the sun go down if you get here early enough. Next up, if credentials were needed to run a wine bar, owning your own vineyard would certainly help. And the owner of Pura Cepa on La Cala high street Bernardo Diego Pullido, 30, has three, including one nearby in Mijas. What began as a wine shop is now one of La Cala’s finest places to ‘tapear’ and, of course, drink wine. There are always more than 40 wines by the glass and around a dozen fabulous tapas to dip into. There is also an amazing list of gin and tonics, should you decide for something stronger. Up in the pueblo you have an equally exciting range of restaurants and new places seem to open by the month. There are some excellent wine bars and places to eat tapas, but few beat La Bodega del Pintor, which has a lovely hidden garden at the back. Here you will find the charming spot, where its welcoming owner Amparo was actually born. Sitting in a historic 300-year-old townhouse it is atmospheric in the extreme and serves up plenty of wines by the glass, alongside some delicious local tapas. “I wanted to create the sense that you are dining in someone’s home,” explains Amparo, whose mother, 86, still lives upstairs. “The whole family comes and goes and my brother even runs an apartment hotel at the back,” she adds. Another excellent place to visit is La Bella Coppia, an Italian, which has been run by Pedro for nearly three decades and just gets better and better. The place has a great range of pasta and pizza dishes, but in particular specialises in steaks and quality meats, cooked on the amazing grill. Make sure Pedro cuts you a few slices of his amazing ham. Next door is the well established stalwart Restaurante La Reja, which is charm personified and has an amazing dining terrace looking over Mijas and the faraway hills. Also be sure to look out for the oasis that is known as the Secret Garden, which sits behind its more typical white-walled sister restaurant Aroma. This amazing garden is a delight to kick back and dine in good weather and the menu is a nice mix of authentic Iberian dishes alongside Argentinean fare – particularly steaks – thanks to co-owner Hugo German. Part of a group of restaurants owned by Hugo and his business partner Thomas Weller, make sure to look out for Taberna Meguinez (which means ‘Are you winking at me?’) which has an excellent menu, as well as Latitud 36, a great fish restaurant. You should also look out for Tapintxos, which is inspired by Thomas’s love of the north of Spain not to mention his new Italian La Cucine di Nico, where I ate some amazing osso bucco.